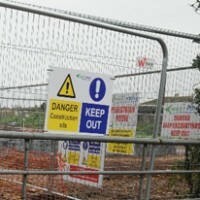 Home » News » Keeping construction sites secure. James Shelley looks at the growing importance of construction site security. The onerous task of managing risk on construction sites seems to grow day by day. It’s not simply a question of keeping out unauthorised personnel, taking measures to prevent theft, vandalism or arson and ensuring that machinery is maintained properly and used as intended. Protocols on data security are now routinely being included in risk assessments, sitting alongside strategies proven to help safeguard project infrastructure and construction workers. Security breaches impact not only on financial margins, but can also adversely affect business reputation and the viability of projects. Even the wellbeing of people working on and visiting site is at stake. Construction sites are constantly evolving so this is a complex area. We therefore welcome the Chartered Institute of Building (CIOB) report, which outlines six principles of a ‘security mindset’ to help identify and manage security issues. As well as guidance on dealing with the risks arising from unauthorised data access, sharing and manipulation, it contains a useful checklist that addresses governance, personnel and physical security measures, as well as cyber security. Incidents where vehicles are deliberately driven at pedestrians – witnessed across Europe in the past few years – serve as a stark reminder of just how important it is to deploy appropriate measures at industrial and commercial project sites. Accredited street furniture that complies with the PAS 170 security standard is purpose-designed to protect schemes against deliberate criminal acts, such as ram raiding, as well as accidental collisions. Appropriate street furniture must be ‘designed in’ at the planning stage, rather than introduced once the horse has bolted. To their credit, manufacturers are stepping up to the mark to provide a greater choice of products that can withstand different levels of impact and are truly fit for purpose. As the CIOB takes a lead role in educating construction site managers about data security and product manufacturers commit to more testing, it is reassuring to know that key stakeholders are working towards the same goal: to keep construction sites safe and secure. Read the CIOB Article: New CIOB report on the importance of security in construction. Download the CIOB: The Role of Security in the Construction Industry.